Our diagnostic tools will show you where you are in your innovation journey and provide you with insights on how to leverage innovation to solve key business challenges. Our innovation training workshops are designed to disrupt traditional thinking, develop creativity & leadership skills, and lead to a more innovative culture. Our leadership development programs help executives become more effective leaders and adopt the behaviors necessary to sustain a climate that supports innovation. We partner with clients to define business innovation critical success factors and connect innovation culture change to business growth strategies. DeSai Innoventures & Research is a platform to research, incubate and launch "Indispensable Innovations" and to help formalize, model and replicate associated "Innoventure" processes. The DeSai Group has established a strong presence in India, helping local firms and multi-nationals accelerate their growth in India as well as expanding their reach outside of India. The DeSai Group's CEO is available for your next executive retreat as a keynote for conferences, seminars, and leadership development programs. 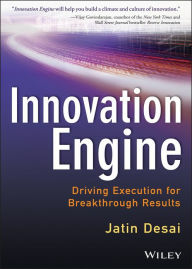 The DeSai Group's Innovation Lab is a unique professional venue designed to stimulate and leverage creative thinking.